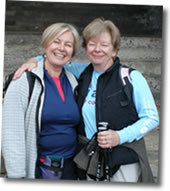 Last year Teresa and I had planned two sections of our beloved Camino but it was not to be. Teresa was ill with pneumonia which meant walking for 6 days was not a possible outcome so instead we used our flights to Biarrritz and I made sure she recuperated. Now happily we are both in great health and tomorrow morning are flying to Biarritz/Bayonne. We will have a night in Bayonne and then on Tuesday will travel to Aire sur Adour and start back on the Camino on Wednesday morning, can’t wait. Due to now owning an ipad mini, I’m hoping that I will be able to blog from the trail and keep everyone more updated, fingers crossed. We are also hoping for much more sunshine and much less mud this section.